Since it’s almost July 4th, I thought I’d share some red, white, and blue today with these turquoise and red frames. I’ve been buying up small frames with a lot of detail like these. They’re a lot of fun to play with since those details hold the glaze and antiquing dust so well. NOTE: I decided to list these in my Etsy shop. 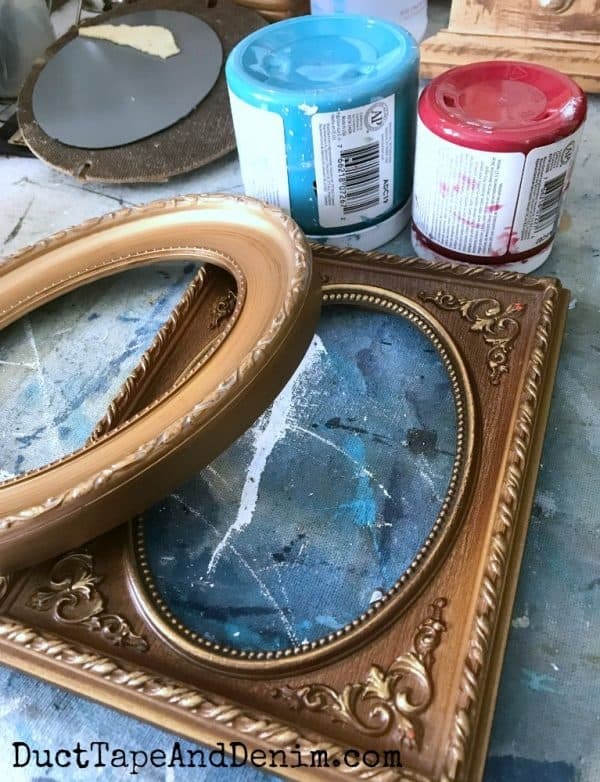 Take a look if you don’t want to paint them yourself! First, I cleaned the frames. Thrift store frames can be pretty dusty. Especially when they have a lot of detail on them like these frames had. Next, two coats of turquoise paint. Pretty, but I wanted the detail on the frames to stand out even more. Did you see me scratch the finish? I didn’t realize there was some dried paint on my rag when I was removing the glaze and it scratched the paint. But I went back over that area with the same steps and it all blended in just fine. 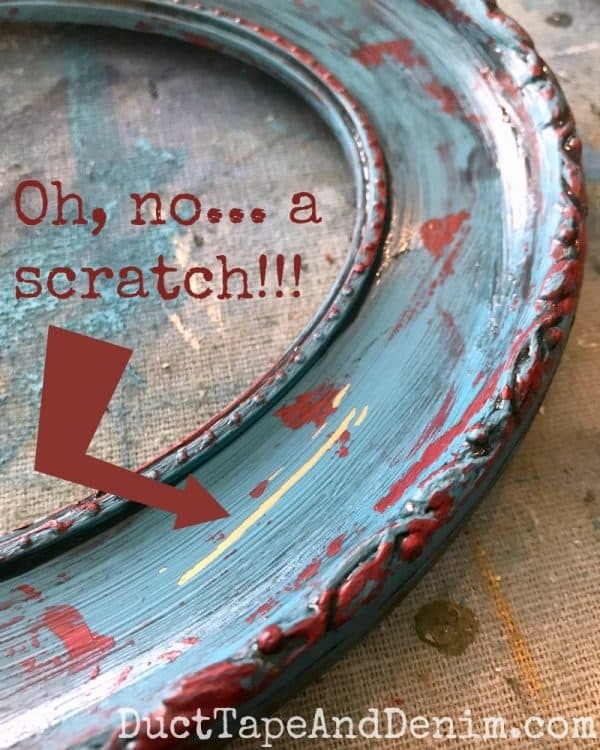 So what do you think of this finish? I think I’ll try it in a different color combination. 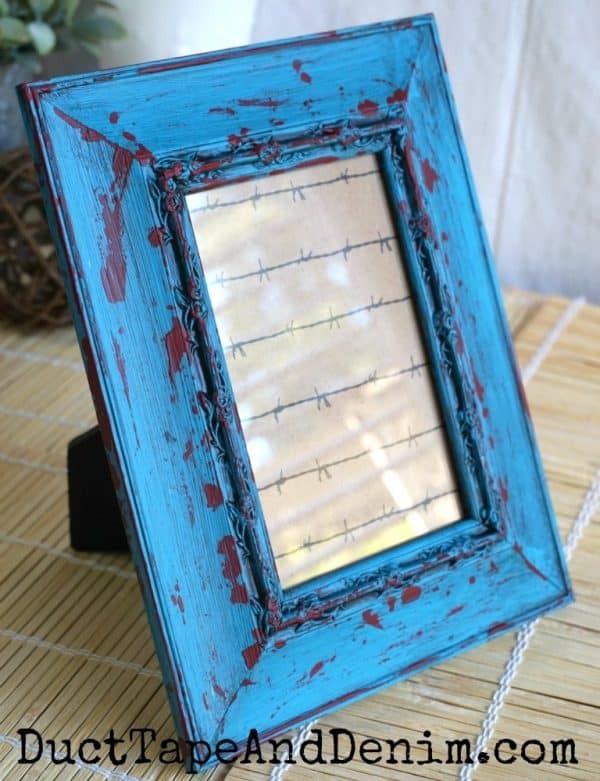 This frame especially looks a little like it’s a piece of evidence from a crime scene! Eeeek! Maybe I should use these for Halloween decorations? 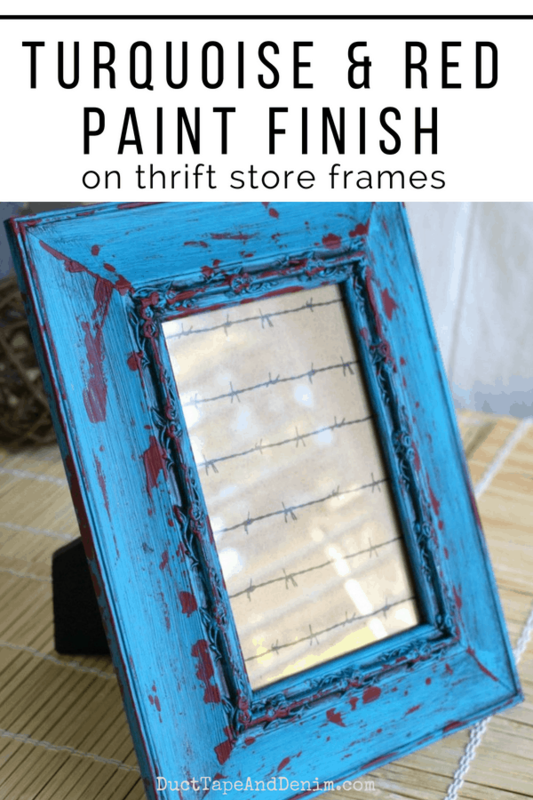 I’d love to hear about your latest thrift store frame makeover. Leave me a comment! We share at these blog parties. 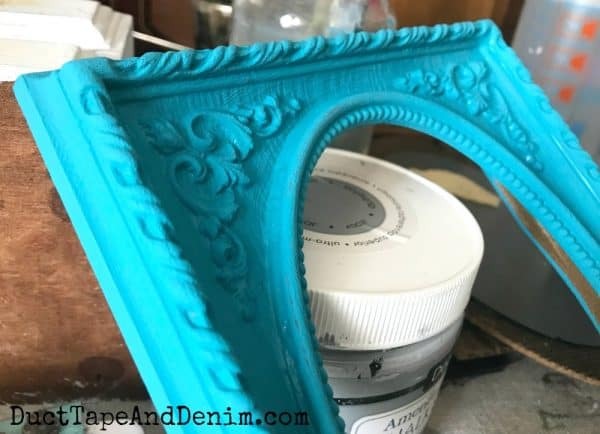 Featured on Crafty Moms Share. I really enjoyed your tutorial. 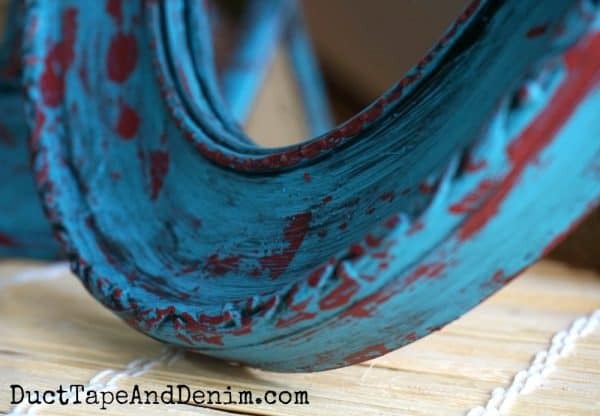 I never would have thought of red and turquoise together, but I really liked the idea of a wall grouping of them. i’ve always been a dry-brusher so the pallette knife technique was interesting! I still love the standards of white with gold, gold/black, silver/black, red/gold, brown/gold (old Italian colors!) and copper or bronze/black/verdigris green. Maybe I’ll come up with some prints and frames that fit, pick up 2 colors from them and get adventuresome! Thrift stores always have great frames. Great idea to make them over. Thank you for sharing on Merry Monday! Hope to see ya next week! 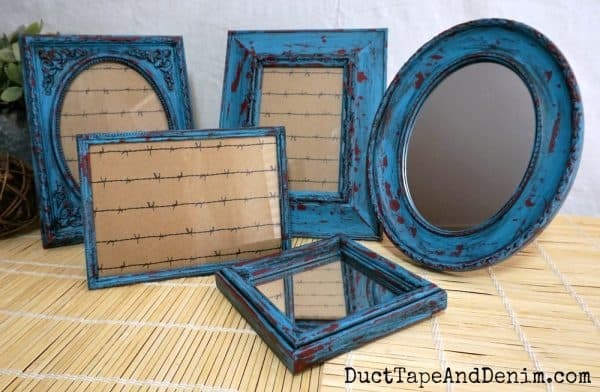 I love to see thrift shop makeovers!! Thank you for sharing on Oh My Heartsie Girls WW last week! It has been shared on Pinterest and will be shared on Instagram. Very cute! Two of my favorite colors. Thanks for sharing with SYC.